I love snowmen. In fact, I love them so much that I’ve had a snowman collection since 2008. I just find them super cute and can’t resist a snowman figuring or other piece of home decor! One of the things that I didn’t already own though was an adorable pair of snowman earrings! That’s where these DIY snowman earrings come in! I love them almost as much as I love our DIY Snowman Candle craft! They’re super cute and simple Christmas earrings, make an amazing homemade gift idea and of course, feature my favorite winter characters! These cute little earrings only take a few minutes to make which means you can make several sets at the same time. You could even find Santa charms, snowflake charms, candy canes or Christmas trees to make too and give someone an entire set of Christmas earrings for just a few dollars. Christmas gifts don’t need to be expensive and these snowman earrings are sure to make your gift recipient love your gift for years to come. For this project, we used snowman beads that we picked up on Amazon HERE. Keep in mind you don’t need to use the exact beads we used either. Any snowman bead will look good provided it is large enough for the hooks you buy. Speaking of the earring hooks, make certain that you only buy sterling silver ear wire. This way, if your gift recipient has any allergies, it won’t be an issue. These supplies will make one earring. 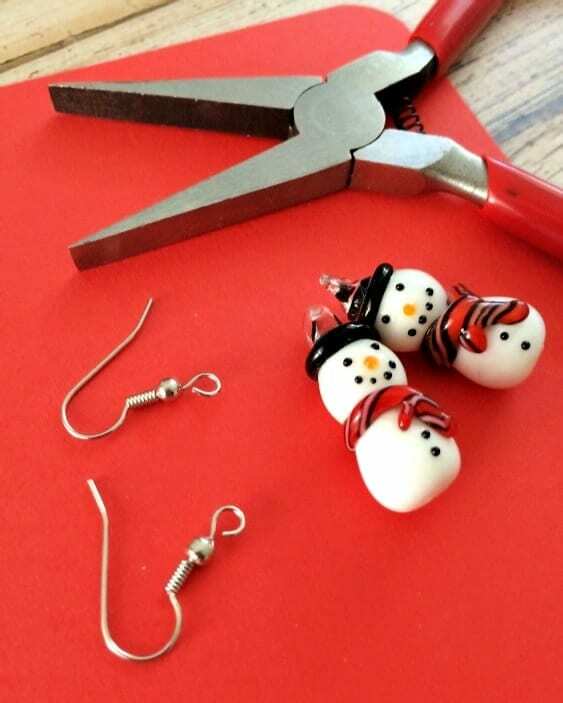 You will need two sets of supplies for each pair of snowman earrings you want to make. As I said above, these Christmas earrings are super easy to make. You can quite literally make a pair of snowman earrings in less than 5 minutes each. This is why they make such an amazing Christmas gift idea. They’re quick, cute and anyone can do them! These would be amazing in a gift basket along side our DIY snowman candle, our green tea and peppermint bath soak and our homemade bubble bath recipe. 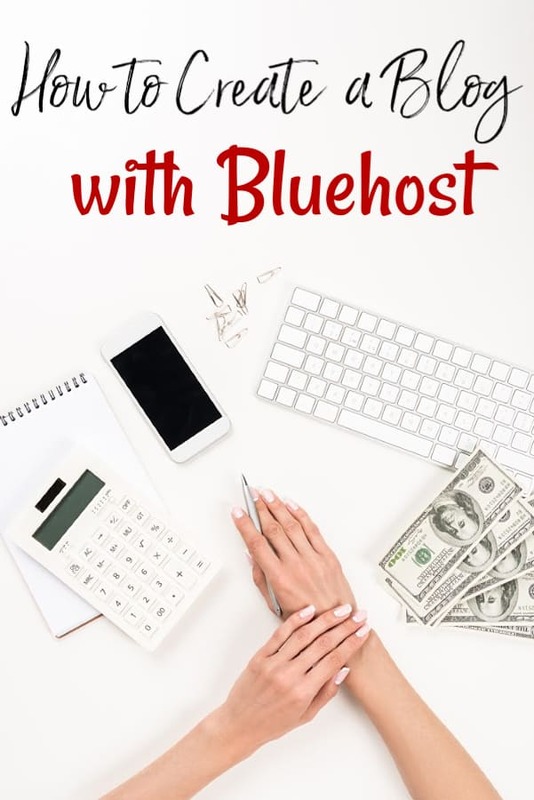 What’s better than a gift that allows you to have a spa night for free? 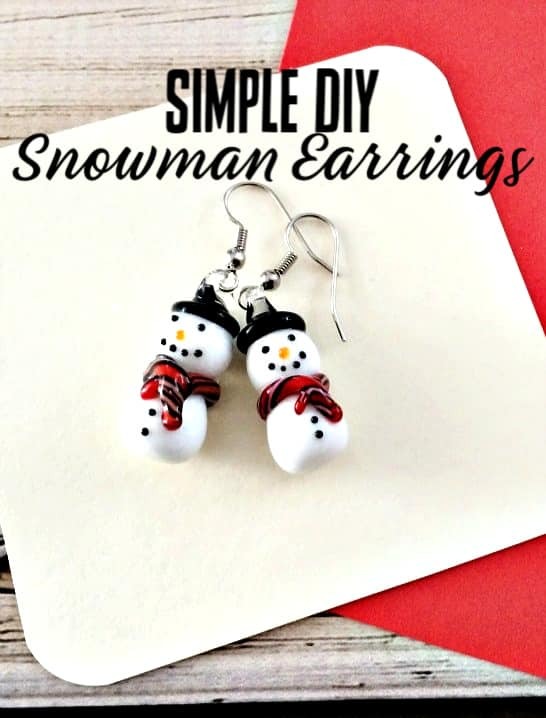 If you want to make these DIY snowmen earrings super cheap, check out these 39 ways to earn FREE gift cards. You can use the gift cards to “buy” the supplies for them without paying anything out of pocket! To start, grab the flat nose pliers and pry the loop on the fishhook earring hooks open enough to slip the snowman charm – or whatever charms you’re using – onto the hook. Slide one of the snowman beads onto the loop of the fishhook ear wire. Use the flat nosed pliers to close the wire loop and you’re done! If you are planning on gifting these homemade earrings, place them in a nice gift box. Tie a pretty ribbon or piece of Christmas colored twine around the gift box and you’re good to go!